Why should one not kill and eat it? - !! Welcome to Sudarshana Sena !! Home / Must Know / Popular / Sudarshanasena / Why should one not kill and eat it? - If a cow eats something poisonous by mistake, and we drink its milk, will we fall ill? To find out, one cow was regularly fed a particular quantity of a poison every day. After 24 hours, its blood, urine, dung and milk were tested in a lab to check where the poison could be found. In this way, the tests were done not for 1 or 2 days, but continuously for 90 days in All India Institute of Medical Sciences (AIIMS) New Delhi. The researcher did not find any trace of poison in milk, blood, urine or dung of that cow. Then where did this poison fed for 90 days go? Just like Lord Shiva held poison in his throat, the go-matha hid the entire poison in her throat. This is a special quality that no other animal has. - This is the only creature that inhales oxygen and also exhales oxygen. - Cow milk has the quality of countering poison. - There are diseases that medical science has not yet understood; urine of Go-matha has the power to cure them. - If cow-ghee and rice are cooked together, two powerful gases called ethylene-oxide, propylene-oxide are released. Propylene-oxide is the best gas used for creating artificial rain. - Cow urine is the world’s best killer of microbes. 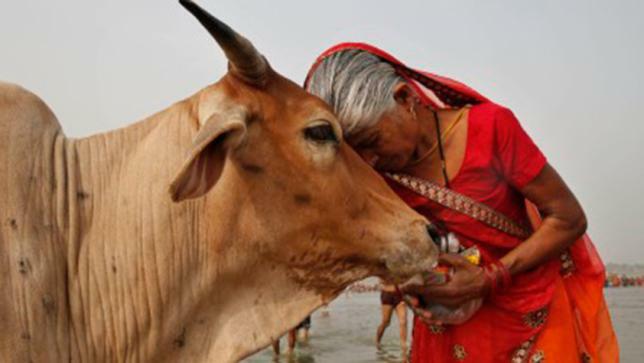 - With medicines made using cow dung and cow urine, stomach-related ailments can be cured. Can we see unity in diversity anywhere in the world other than in India? Whether we are a Hindu or a Muslim, or a Christian, as long as we live in our country, we are an Indian. Respecting the culture and tradition of our country is our dharma. Freedom does not mean “live as we please”. It means living in a way that our country would like.